Help! Where do I put my grill? Archadeck of Columbus welcomes the season for grilling with designs especially suited for grilling out on your deck, porch or patio. This TimberTech deck has a special covered area perfect for grilling out when summer showers arrive to keep the cook dry. With the season of outdoor living in full swing many of us look forward to the smell of delicious food cooking on the grill and the camaraderie that so often comes along with it. If you want your grill to be part of your new outdoor living area, you need to take some serious considerations into account when designing your new area. You want the location of your grill to be extremely convenient. 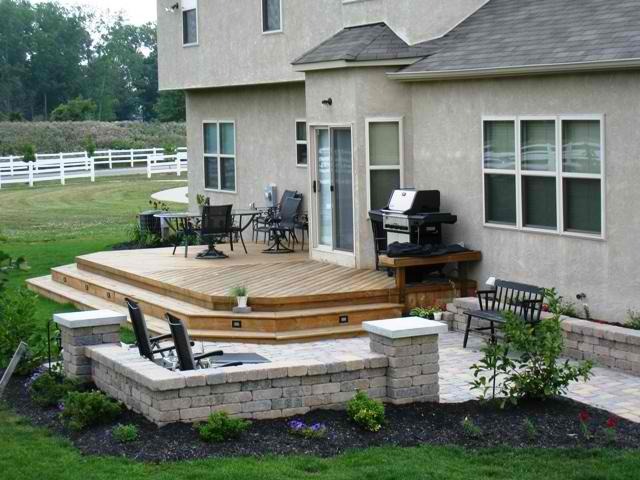 You can either allocate space on your deck, porch or patio for a grill. Another viable option is to actually add space by extending an area for your grill on your deck, porch or patio such as a deck bump-out or a grill rack. A few helpful hints to remember if you are planning on incorporating your grill into your deck or patio is that sizes of various grills can differ. A typical gill is 4.5′ wide, but larger models can span from 5′ to 5.5′. With this in mind you want to consider the amount of space the grill will take up and allowing enough space for walking room and maneuverability around the grill. If you have a smoker, or are planning on getting one you will also need to allocate enough space for it as well. You will also want to leave a 2 x 6′ area for the grill and additional room for any accompaniment pieces, such as a smoker. This low-to-grade deck and patio has built-in bench seating near the grill area to add comfort and convenience for the cook! Deciding what functionality you want your grill area to serve is important to confirm when planning your deck, patio or porch addition. Decisions such as whether or not you are intent on “hanging out” around your grill while entertaining, or whether you will need or want a seating area next to the grill will help determine what type of space you need. If serving food right from the grill is something you like to be able to do, then a nice sized rail could be the perfect place to put serving platters or rest dinnerware while you and your guests are filling your plates. If you entertain often, you might consider a buffet table in close proximity to your grill that can also hold serving platters. 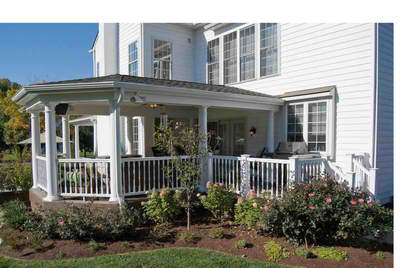 The design of this open porch allows the grill to be “tucked away” and out of the flow of traffic. Key considerations include having the grill out-of-the-way so it doesn’t inhibit traffic flow, or maybe you want the grill area close to the kitchen to make bringing stuff back and forth more convenient. You don’t want to design a grill area that is too close to the house because the heat is a safety concern and can also discolor your siding or home’s exterior materials. But you do want to design it close enough that you aren’t “running your legs off” when you grill or entertain. 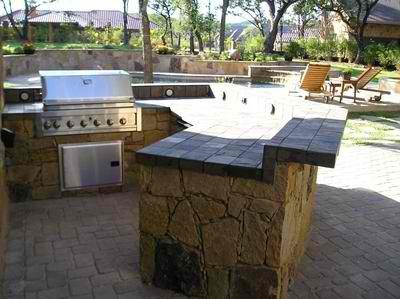 If you entertain often then maybe an outdoor kitchen would fit your needs better than a grill area. Outdoor kitchens can be outfitted with anything from grills and food preparation areas to refrigerators, food warming drawers and much more. 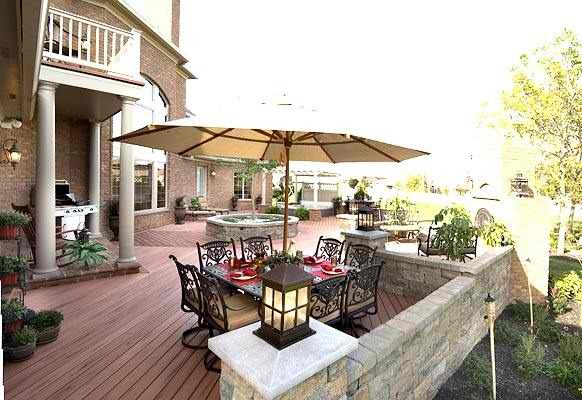 Maybe an outdoor kitchen is the best choice for your deck, porch or patio? If grilling during inclement weather is a concern you might consider creating an outdoor structure that would allow for you to grill regardless of rain or snow such as an open porch. A key consideration for grilling out when weather is an issue is the location of your grill in relation to the prevailing winds. If the prevailing winds are West then you would want your grill to be located in the opposite direction. Food stains are also a key point to consider. Many decking materials will stain from food grease spills such as barbecue sauce or wine so it’s important to try to clean them at the time of the stain just as you would inside your home. No matter what your pleasure, Archadeck of Columbus can make the grilling experience a more enjoyable and convenient one by designing your outdoor structure to best suit your lifestyle. Grill on, and contact us to make the most out of your deck, patio or porch this grilling season. Bon Appetit! Author archadeckofcolumbusPosted on May 23, 2012 Categories Outdoor KitchensTags Adding a grill area to your OH outdoor structure, Archadeck of Columbus, Clumbus OH grilling patios, Columbus decks, Columbus OH bumpout decks for grills, Columbus OH covered areas for grills, Columbus OH grill friendly outdoor structure designs, Columbus OH grilling decks, Columbus OH grilling porches, Columbus OH outdoor kitchens, Decks, outdoor living, Patio and deck combinations, TimberTech deck ColumbusLeave a comment on Help! Where do I put my grill?